Game description: The first-ever 3D version of King of Fighters has finally arrived, complete with all your favorite SNK characters. In King of Fighters: Maximum Impact, rival gangs are vying for the chance to rule the underworld of Southtown. As one of more than 16 fighters, you must prove that you're the greatest fighter in the world in five gameplay modes, including Story, Versus, Survival, Practice, and Training. The game's enhanced character movement lets you perform four new jumps, powerful combo moves, and the new Knock Back Attack. 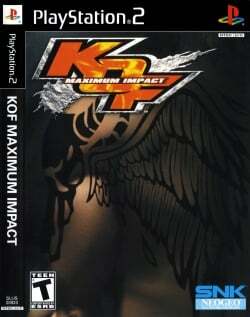 King of Fighers: Maximum Impact is the first KOF title to be designed specifically for the PlayStation 2, rather than being based on any existing SNK arcade version. Maximum Impact features 24 of the most popular KOF characters such as Terry Bogard and Kyo Kusanagi all rendered in 3D. The game also features six brand new characters to the franchise, 4 unlockable characters, and a wide assortment of detailed battlegrounds and fighting maneuvers. Last tested on PCSX2 0.9.4, unknown status with 0.9.8 or newer., Playable but slow. This page was last edited on 22 June 2018, at 19:08.